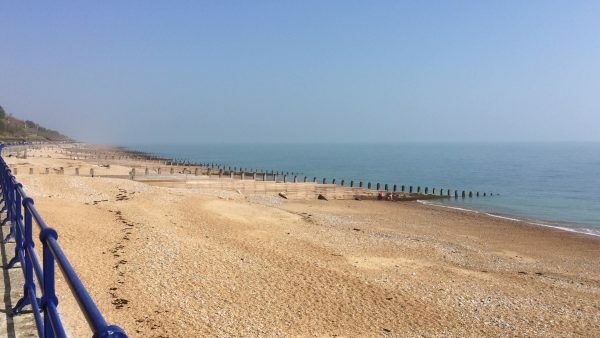 It is another sunny day and we can think of nothing better than a trip to the seaside, or to be more precise a wander along the promenade at Eastbourne. It is only a short walk into the town from Black Robin Farm CL. 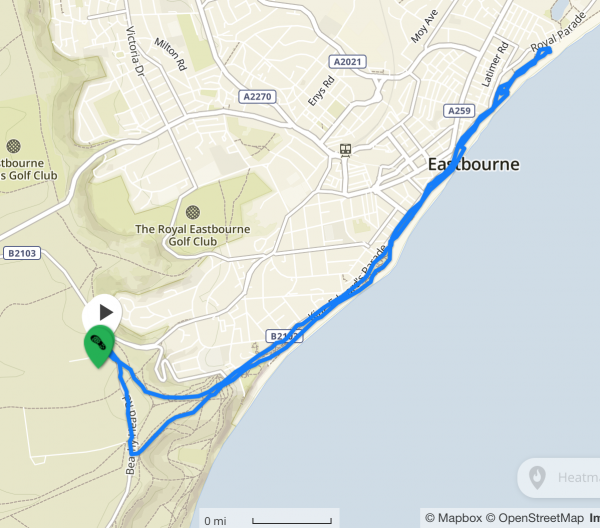 On leaving the site we turn right and walk on the broad grassy path towards Beachy Head and then after half a mile we turn left to follow the path downhill into Eastbourne. We enter the edge of the town by St Bede’s Prep school; apparently Eddie Izzard was once a pupil here. We then follow our instincts and at every opportunity head towards the sea. 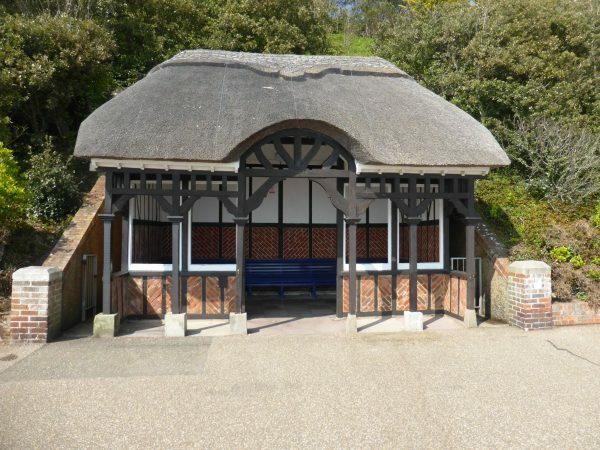 There are attractive sea front shelters and a continuous row of memorial benches. This is a popular retirement resort and so there is no shortage of people to be remembered fondly. I assume there must come a point when potential bench space runs out. As we walk along we speculate what the policy is for coping with an overcrowding of benches. Do you have to wait for one to fall apart to get a spot, or will the coastline eventually be one long line of benches? No matter what the policy is, it is a good spot for loved ones to sit and remember those they have lost. It is that warm that folk are on the beach and a few hardy souls are brave, or foolhardy enough to get into the sea. Freddy’s don’t voluntarily enter the water unless it is an emergency and to do so in the first week of April is unbelievable. 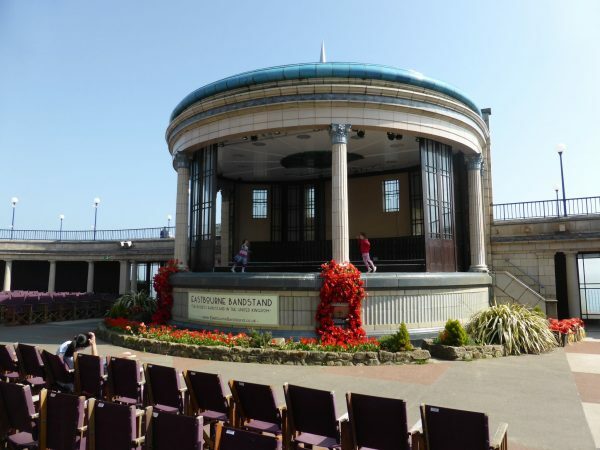 Our route takes us right through Eastbourne Bandstand, this is a wonderful spot and two small girls are giving an impromptu performance, there enthusiasm is infectious and they have a small but appreciative audience. Eastbourne Bandstand was built in 1935, and apparently there is no other like it in the UK. Alongside the main arena it boasts a middle and upper balcony, at one time it’s seating capacity was 3,500, now it is still an impressive 1,600. At one time there would be a Military Band playing here from Easter until the end of October, but the attraction of this type of entertainment dwindled and now the forthcoming events seem to be dominated by tribute bands. At least it keeps this wonderful building open. 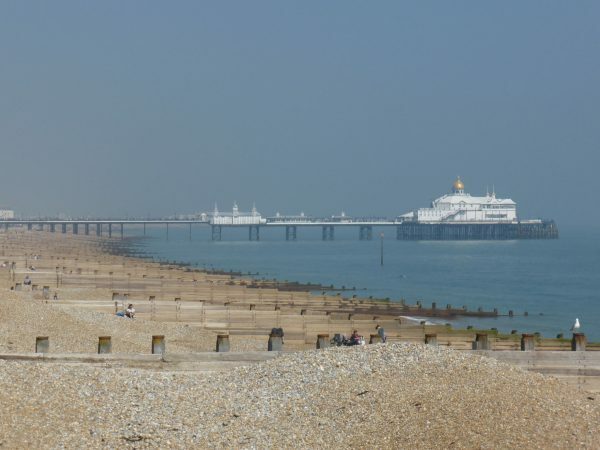 Next up is Eastbourne Pier; this is a grand structure with golden domes. 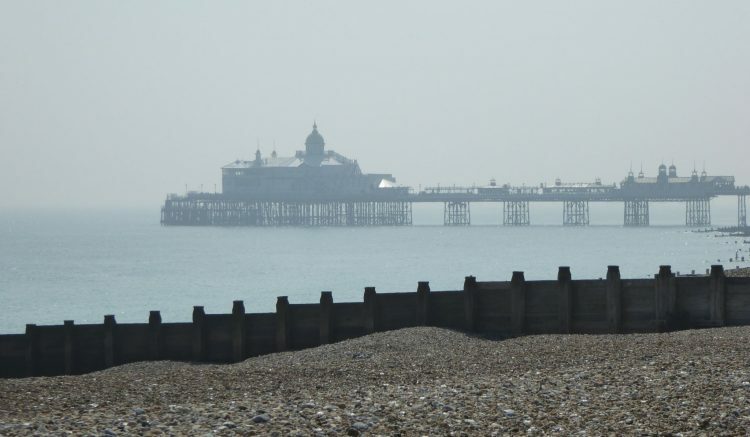 Unfortunately we can only view it from the promenade, as dogs are not allowed onto the pier. 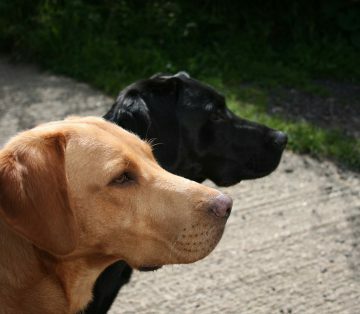 A great pity because we would have liked a walk along. Eastbourne Pier opened in 1870 after four years of construction. Unfortunately a storm struck on New Years Day 1877 and the landward half was swept away. When it was rebuilt is was on a higher level so there is a drop towards the end of the pier. It is 1,000 feet long and the original 400-seater pavilion was built in 1888 and then replaced by a 1,000-seat theatre in 1899/1901. During World War II it was used defensively with machine guns and anti-aircraft guns sited on it. After the war it returned to an entertainment venue, the pier theatre was destroyed by fire in 1970 and then replaced. Further tragedy struck the pier on 30th July 2014 in the form of a very damaging fire; thankfully it has now been restored. 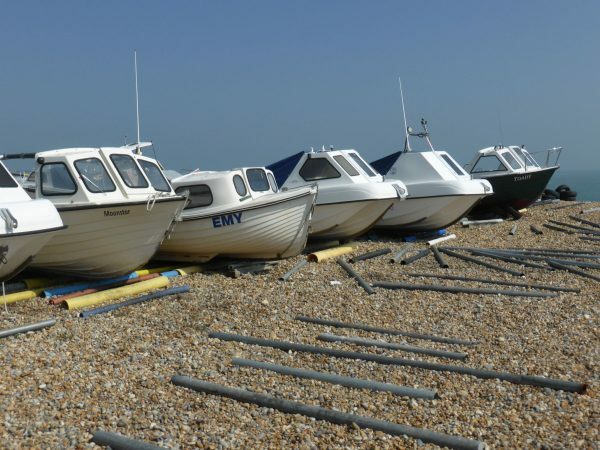 We continue along the front in an easterly direction and soon reach the beached fishing fleet, there is a harbour a bit further along the coast, but these boats are hauled from the water by chains and secured on the beach. We arrive at the RNLI Lifeboat Station and decide we have probably gone far enough. We are having a night out with friends in Hastings tonight and don’t want to be late, so we turn around and head back. 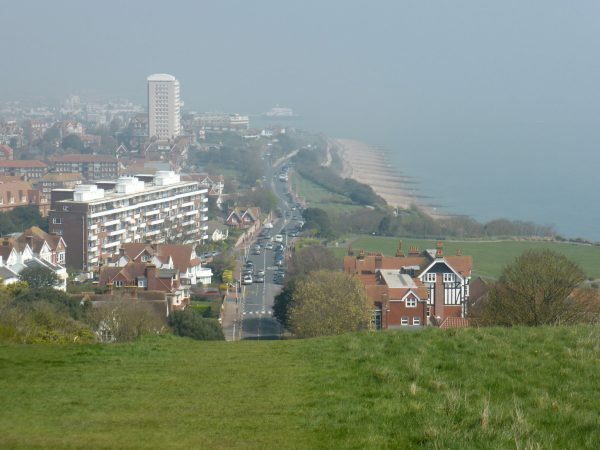 We soon reach Eastbourne Redoubt and stop to have a look around. This coastal fort was built in 1805 as a preventative measure to foil a French invasion during the Napoleonic Wars. 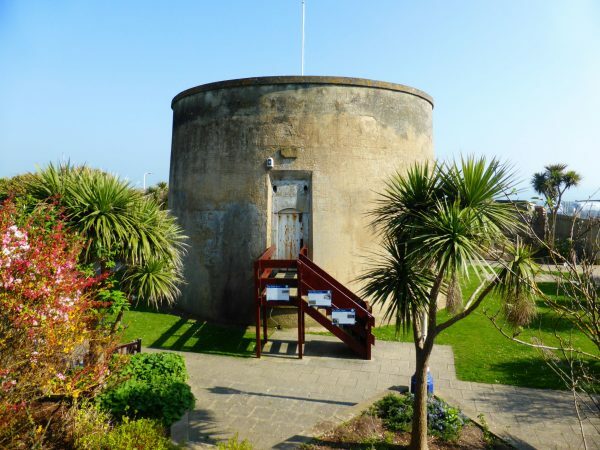 I have previously written about the Martello Towers that are such a feature of this coastline. 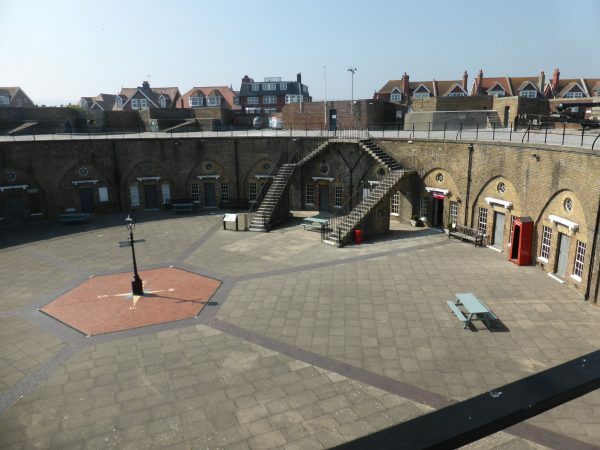 The redoubt was built as a garrison and depot to provide ammunition and supplies to the troops in the seventy-four Martello Towers along the coast between Folkestone and Seaford. It was a well-equipped fort in its own right. 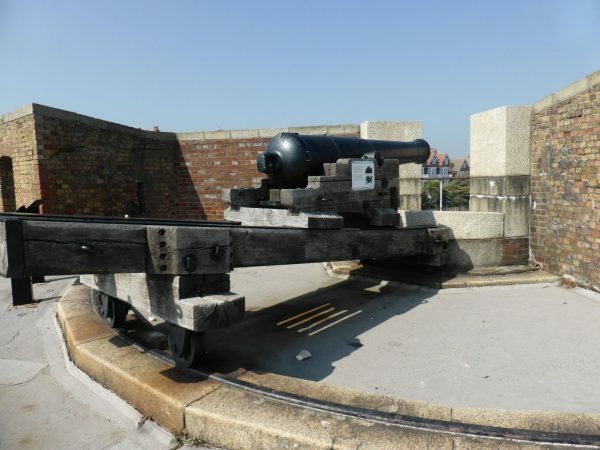 There are a number of cannons still in situ, an information board explains that 32lb round shot from a cannon would be accurate to 1000 yards and could reach up to 2,000 yards. 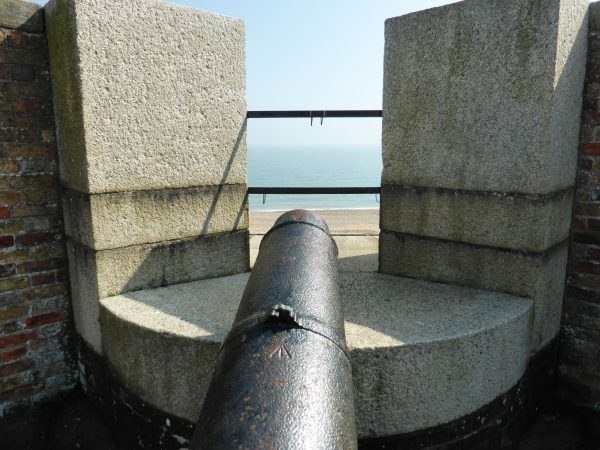 Because of the structure and the cannons manoeuvrability a target could be attacked by at least three cannons at any one time. It is an impressive site and one requiring a more detailed exploration, so after a cursory tour we continue on our way. Had I put my thinking head on I would have realised there was an ulterior reason for Lynnie wanting to head back along the seafront. She had spotted an Ice cream parlour, not run of the mill ice cream, but Fusciardi’s a specialist Italian Ice Cream parlour. Continuing on we reach what is now known as the Wish Tower, this is Martello Tower number 73 of the original seventy-four along this coast. Only forty-three now remain, two of which are in public hands and this is one of them (the other is in Dymchurch). We soon reach a park in where there is a statue of Spencer Cavendish the 8th Duke of Devonshire (1833 to 1908). He was Mayor of Eastbourne from 1897 to 1898. But his political activities were far greater than that and he is considered a statesman. Apparently he has the distinction of being the leader of three political parties (leader of the Liberal Party in the House of Commons 1875-1880; the Liberal Unionist Party (1886-1903) and the Unionists in the House of Lords (1902 to 1903). Following Disraeli’s government in 1880 he was invited to form a government but declined, after the 1886 election he had a second opportunity to be Prime Minster, but instead chose to have the balance of power and supported Lord Salisbury’s Conservative Government. When Lord Salisbury stepped aside he was again invited to become Prime Minister and declined. There is also a statue to him in Whitehall. This one in the Carpet Garden Eastbourne was paid for by public subscription, so he was obviously held in high regard. 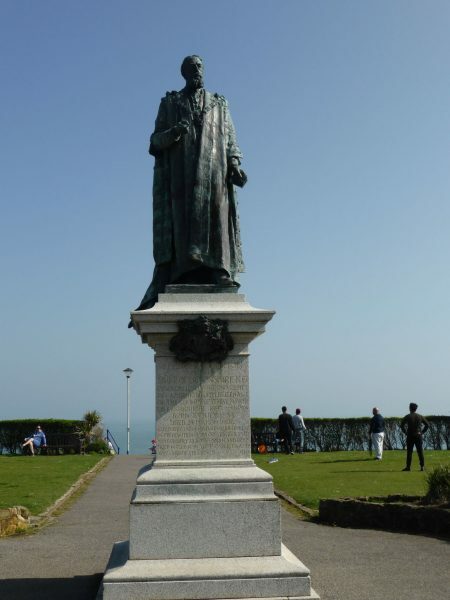 Heading out of Eastbourne I start to consider if the more recent alliance of a Liberal leader with the Conservative party will result in people wanting to build a statue to a chap called Clegg, (Remember him? You should he has a lot to answer for!). Some how I doubt it! 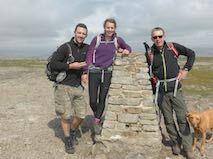 Our stroll has covered seven and a half miles and has been packed with interesting things to see. 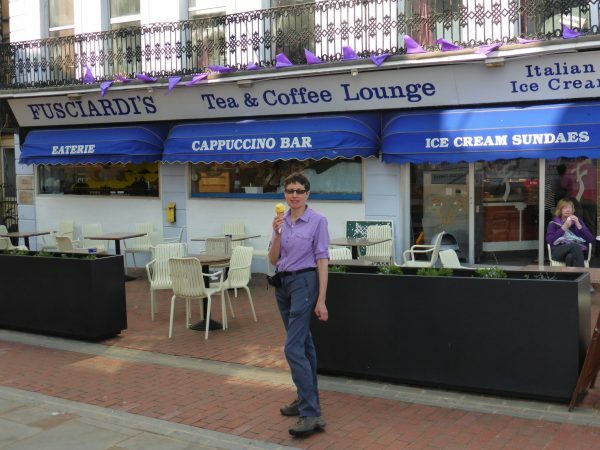 There is no doubt that for Lynnie discovering Fusciardi’s Ice Cream parlour has been the highlight. After sorting ourselves out we head out for an evening with our very special friends, Maurice, Jane, Carlos and Julie. We have a cracking evening in a proper boozer called the Last In First Out in Old Hastings, unfortunately I am driving so can not do justice to the range of beers they brew.